A lot of people ask if the color in my images is real. Is it created with Photoshop or filters or some magic formula? The answer will vary depending on the image but over the last few years I have been refining a method using High Dynamic Range image processing as Tone Mapped images. I use an application plugin for this purpose, Photomatix plugin for Aperture. The idea is to create a 32bit image from a bracket of separate exposures so that all details in a scene are captured at best exposure. The controls in the plugin allow you to re map the tones so that an 8bit or 16bit file can be created with all areas of the scene showing best exposure. There is a tendency for HDR images to look oversaturated and unreal. This is due to tones being all in the midrange and can be controlled to a large degree. 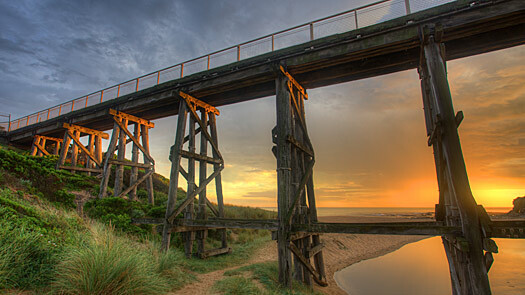 When shooting a sunset such as the one at Kilcunda above I wanted to show just how the original colors looked. All photographic reproduction calls for some remapping of tones so that very high dynamic range original scenery reproduces on the target media. For me this is a digital reproduction to photo paper for framing. HDR processing gives a much better capacity to achieve this. 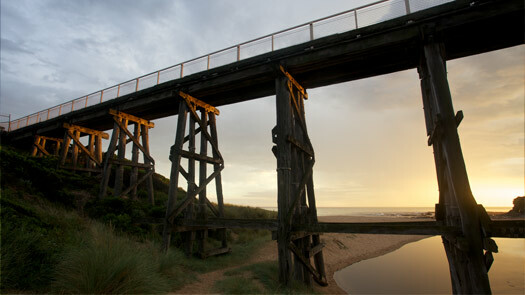 In the example above the before image is auto exposure and color balance showing very little detail of the bridge itself or much density in the sunset. This is due to the image sensor not having the capacity to expose across such a large exposure range. The after image shows the result of combining 3 exposures two stops apart. Most people are so used to seeing photographic aberrations such as low dynamic range as normal and so their impression of HDR is that there is some form of enhancement going on. While this is an enhancement HDR is as valid as any form of photographic manipulation. Everything from asking people to smile to waiting for the light to improve or selecting a specific exposure is an enhancement of sorts.